As part of my Scottish decade, we'll be continuing with Scottish recipes for some time. It's so exciting to be able to present real Scottish recipes. Not just any old made-up nonsense. Today it's DBS, or Double Brown Stout. Porter and Stout never dominated the Scottish market like they did in England. Yes, Scottish brewers made them, but in far smaller quantities than Pale Ales or Mild Ales. One thing is obvious: Younger's versions were lower in gravity. 1062 was their strongest - a gravity that would barely qualify a beer as a Stout in London. Truman brewed their Porters and Stouts from pale, black, brown and amber malt. Whitbread went for pale, brown and black malt, plus sugar. The difference with Younger's grists is the use of brown malt. That's a habit London brewers never gave up, not even in the 20th century. 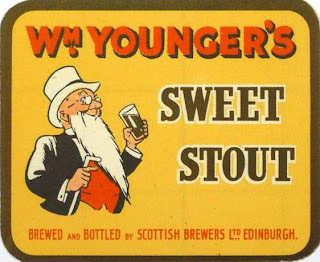 As the 19th century progressed, Younger's beers digressed further from London Stout. They became sweeter and less alcoholic, with apparent attenuation barely hitting 50%. This trend continued into the 20th century, finally resulting in beers like George Younger's Sweetheart Stout. That's me done. Let's see what Kristen has to say . . . . . . . . Same deal as the previous Younger logs. Very simple stuff. Lots of repeats from last week. That will happen when we are doing the Scots stuff. Grist – Four times the malts as normal on this baby! Two pale malts some toasty amber malt and some tasty blackness. I really like Maris Otter for stouty things. I had some Great Western pale malt for the other pale so I decided to go with that one. I’d equally go with the MFB pale but I have more of this and the tastacular MFB would get kinda buried. The amber makes up a pretty good portion of the grist so use something you really like. I tried this also with the MFB special aromatic that would be similar to old timey amber malt. Very different. Give it a shot. The black malt was more Fawcett as its nice and dark. Hops – Three different hops, from three different areas give this beer a really unique profile. Some herby English Fuggles provide most of the bitterness backbone. The Popering Goldings really add a nice citrusy orange character and the Saaz are well, saazy. Very unique but awesome all the way around. Yeast – Use something dry. I really like the Fullers strain…or Nottingham. I noticed that as well Ob—but Ron, didn't you dig up somewhere that Irish black malt was not the same as English black malt of the time? I seem to recall it being dry roasted and somewhere between brown and black. Craig, yes. There was a text that said Irish black malt was quite different. Who knows what the Scottish version was like. Here is an extract decriblig the malt "The Irish brewers' patent malt, however, is not the over-roasted black stuff (giving a rough and burnt flavour) which so often does duty for that material in England. It is rather of a rich chocolate brown"
Both Warminster and Fawcett's still produce both chocolate and "pale chocolate" malt with color (EBC ) around 1100 (chocolate) and 500 - 600(Fawcett's) 380 – 600(Warminster ) for the pale. Suggesting it cam of a brown chocolate color and a much lower could than classic Black malt (1220 - 1440). Stop guessing. B/c Irish patent was 'chocolate malt' don't equate it to pale chocolate for sure. Maybe Brown malt. Nor does it have anything to do with other patent malt. I would speculate, that this patent malt, is the English type. Youngers imported the vast majority of their malt. None of which has been indicated as Irish. Nothing. This is why I have UK Black patent down. I don't want to go the way of a lot of the beer writers we've all be speaking of lately and start guessing for the sake of it. FWIW, there are a lot of black malts that are brown in 'chocolate' color. Fawcett is one of the only ones that looks 'inky'. Also, similar grists for many beers from brewery to brewery are still common. If brewers are trained at the same place or if they worked for a brewery that made a good stout, a lot of brewers bring that recipe with them to the new brewery. I think the difference between the Irish black and chocolate malt would be the roasting process itself. Chocolate malt is wet-roasted while is black (amber and brown, as well) is dry-roasted. I don't know that chocolate malt would impart the roasty and ashy character that a dark, dry-roasted malt would. I've always wanted to try re-roasting some brown malt darker—but not to the level of black patent malt— and see what that does to the beer. By the way, I wasn't meaning to speculate on the Scottish black malt being similar to Irish black malt! I was just commenting on Oblivious' comment about the Guinness grist. Way to lay down the law Kristen! Let me ask you this, the BS porter at 1041, is that the same grist just smaller portions of malt and hops? Or is it different all together? Again, thanks for all your work on this stuff you guys. I'm happy to hear the you will be doing Scottish stuff for awhile. All the info you guys have dug up has been great. I look forward to more Scottish brewing Madness!! Not law. I really don't like to guess with these recipes. If I assume I say so and why. You can see that the % patent in the Bg is relatively higher although more is used in the DBS. Cool, thanks Kristen. And yes I know that you don't like to guess on this stuff. The attention to detail and effort that you and Ron put into these beers is great. I've been bugging you for awhile for info on actual Scottish recipes and now that you guys are doing them it's cleared alot of on stuff the subject. So the biggest difference at Younger between the stout and porter grists was the use of Amber malt. Would that be correct? Tyler, no, not really. The grist of that Bg Porter is different to the other Porter ones. From the same year there's a Porter that's 5 qtrs pale malt, 2 qtrs black and 6 qtrs amber. They seem to have swapped around the grists quite a bit. Tomorrow I'll post more details of Younger's Porter and Stout grists.